The files to compare. If you select two files in the active panel and then choose the Compare Files command, then the File 1 and File 2 areas will contain the show the two files selected. Alternatively, if there is one file selected in the active panel, and another file selected in the passive panel, then AB Commander will set up the File 1 and File 2 areas to compare those files for you. You can also press the buttons with the dots ... to choose other files to compare. 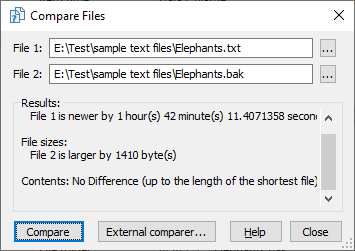 When you press the Find Differences button, AB Commander compares the date and time of the last modification of each file, their sizes, and their contents and displays information about the differences found in this area. If you have set up an third-party application as the external comparer, you can use this button to launch the external comparer and pass it the two files via the command line.